The Other Bull Run – The Bull Boys go From Boats to Bikes! Back in July 2015, Dave and Mitch Bull discovered that a close relative had terminal cancer. Not being hearts and flowers guys, they decided to do something to raise funds for cancer research. Dave owns radio station CBFM and presents the weekday Breakfast Show, as well as writing about life in Spain and editing the popular All Abroad magazine, and he’d recently bought a kayak. So he suggested to Mitch that they row along one of the most dangerous sections of the River Segura from Murcia to Guardamar to raise funds for the Spanish cancer charity AECC. Although Mitch had never even been in a kayak, he agreed, because like a good son, he does what Dad says – most of the time anyway! The Kayak Challenge raised almost €3000 for AECC, but more importantly, it raised awareness of the work of the charity in Spain, and also spotlighted the Samaritans in Spain, of which Dave is a patron. It’s no exaggeration to say that cancer touches every family in the world at some point, and the Samaritans often have to deal with the fallout, and help cancer sufferers and relatives through a very difficult time. Because the Kayak Challenge was so successful, Dave and Mitch have decided to take on a challenge each year to raise funds and awareness of the work of AECC and the Samaritans in Spain. Flushed with the success of the Kayak Challenge, they’ve gone bigger and better. 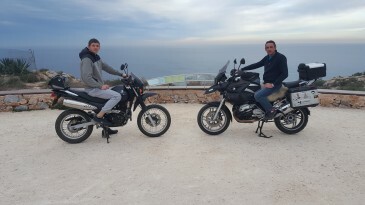 The Motorbike Challenge will see the Bull Boys bike around the perimeter of Spain, avoiding motorways and stopping off at schools and other institutions on the way. They’re hoping that all of Spain will join in to raise money by collecting plastic bottle tops which, will be cashed in to add to the total. Supporters can also pledge funds and organise fund raising events as the boys make their way around Spain in October. Why October? 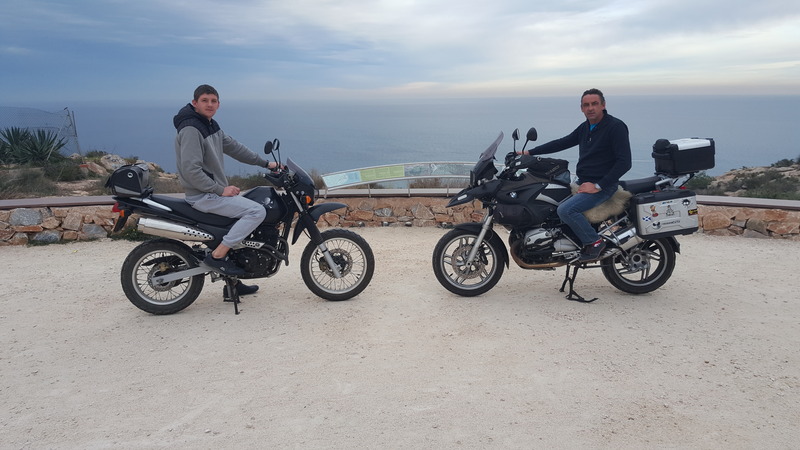 Because that’s the first opportunity for Mitch – who is head chef at La Piedra Bar and Grill at Gran Alacant – to take time off work for the 25 day ride, covering over 6,000 kilometres. Look out for more news on the Motorbike Challenge, and if you’d like to be involved in any way, contact Dave Bull at CBFM Radio or check out the Facebook Page, Riding for Cancer.